Comfort: Get a jersey which will deal with sweat effectively and leave your child cool and dry as they ride. 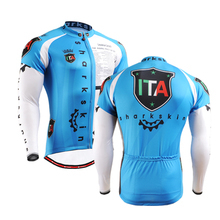 To this end you need to ensure the cycling jersey is made of a fabric that has good moisture wicking properties. Body temperature control: You need to ensure that the jersey is made of a breathable material that will keep your kids from getting uncomfortably hot as they exert themselves. Colors and designs: There are colors that are usually associated with boys and girls. Though you don’t need to adhere to the blue for boys, pink for girls rule, that may be what your kids crave for. If you know your child is in love with a certain cartoon character, you can get them a youth cycling jersey with that character printed on it if it’s available. This will, to some extent, make them look forward to their next ride. Safety: As you’re choosing designs, ensure that the jersey has a high-visibility element to it. Your kid should be easy for motorists to spot on the road to reduce the chances of them being hit. You don’t have to settle for what’s available in stores when it comes to buying a youth cycling jersey. You can get custom-made jerseys for which you can specify the size and kind of print to appear. Kanu Bike Cycling Jersey: This is a perfect companion for your little girl or boy on a summer day’s ride. Made purely from polyester, it has superior wicking capabilities. It is also designed to be highly breathable so your child won’t cook inside while pedaling. This brand has designs specific to boys and girls. There are other brands which have designs for older kids that are simply miniature versions of what adults use. Where to Buy Youth Cycling Jersey?